Reel Monkey Productions filmed and produced a series of videos to help raise awareness and increase the profile of MyDayforRA, an event which brought people from all over Europe to come together and share their experiences of living with rheumatoid arthritis. The actress, Jane Seymour was the guest speaker of the celebratory event in Barcelona and she shared her thoughts with us. 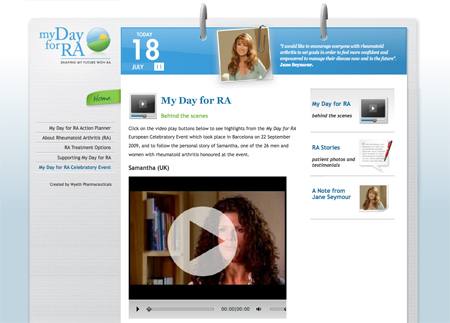 The videos were made availabe on a dedicated ‘MyDayforRA’ website where viewers could be informed and educated about rheumatoid arthritis and hear people’s personal experiences.